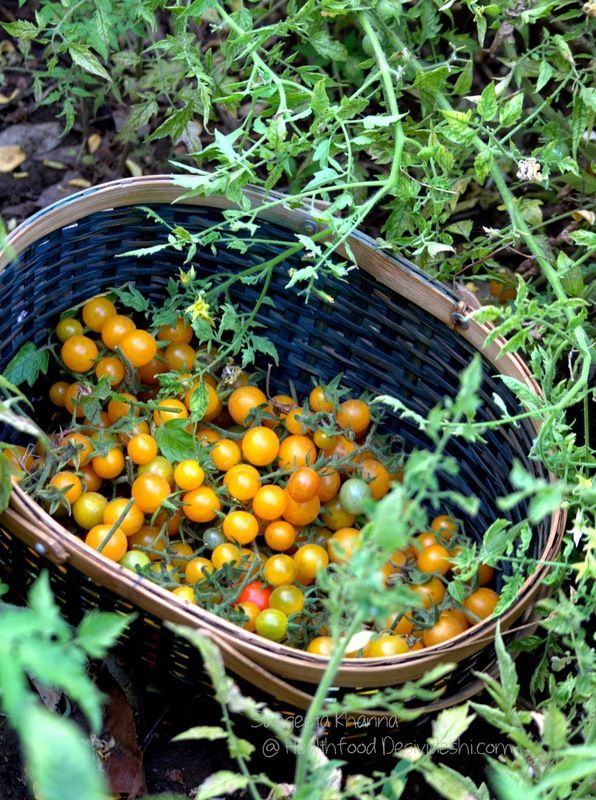 I had planted a few varieties of tomatoes like I do every year but it has become a norm in my garden that only one variety of tomatoes makes a success story in one season. May be it is the survival of the fittest when planted together, it happens somehow that most of the other varieties remain stunted or never come to flower or bear just a few tomatoes when they mature. It could well be true as I plant all the tomato varieties in one place, in adjacent beds. 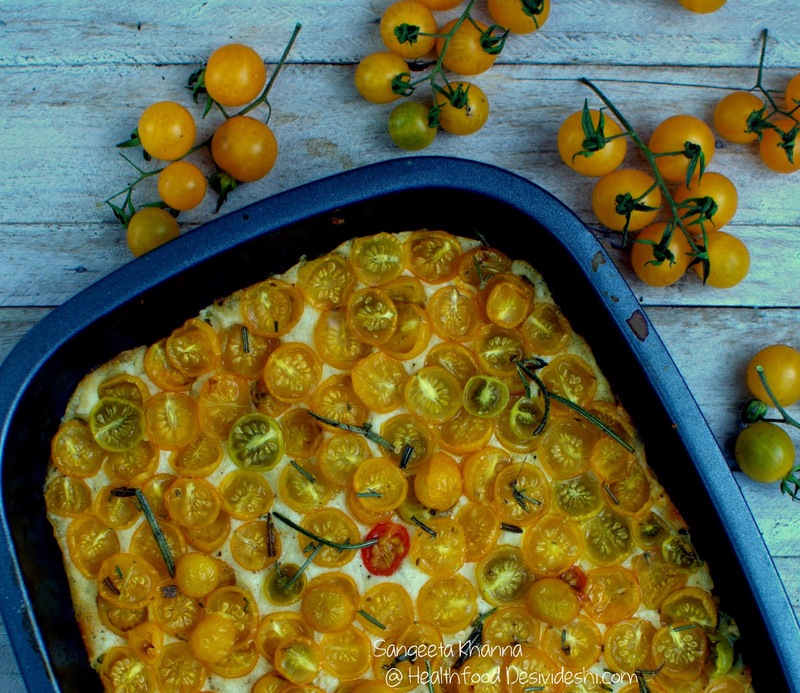 Whatever the reason, this year is the season of yellow cherry tomatoes. And I am not complaining. 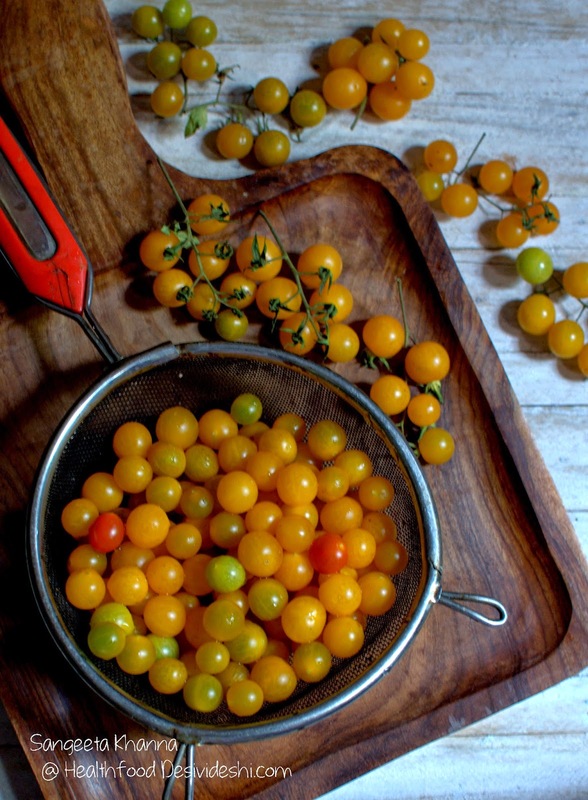 I have been dunking them into salads and popping them into my mouth as it is, some of them are being sun dried for more delicious ways to eat yellow cherry tomatoes. 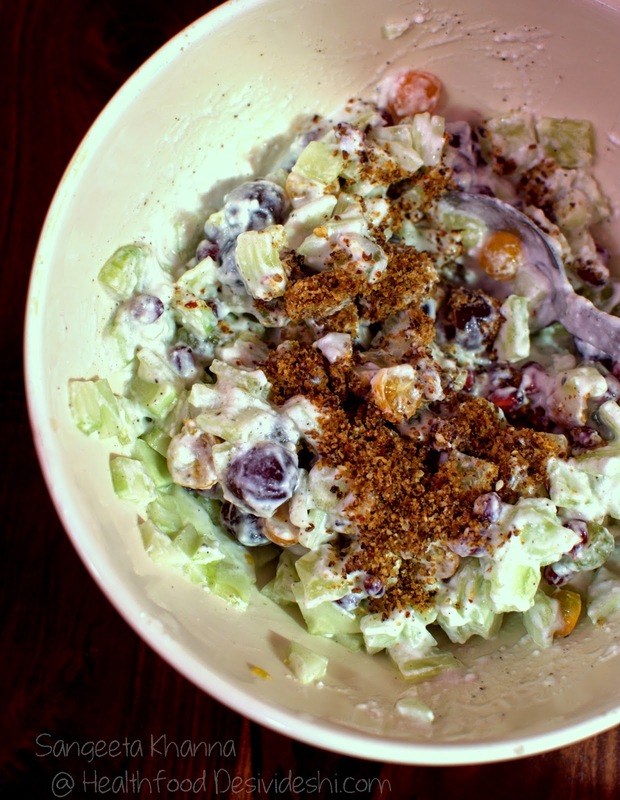 This salad is made using the yellow cherry tomatoes, black and green grapes, chopped cucumber and bits of red onion, everything mixed with some hung yogurt, salt and pepper and a generous sprinkling of flax seed dry chutney. It is a delicious way to eat all the good things of the day in large doses. Another is a chickpeas salad that has been repeated frequently, this picture is from last year when I had got only a few yellow cherry tomatoes. 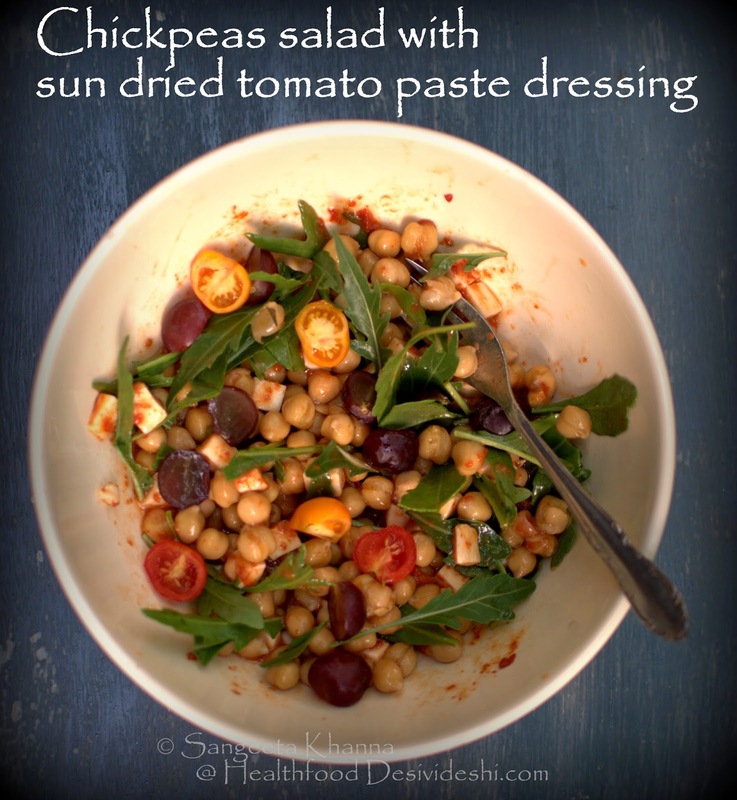 This recipe uses sun dried red cherry tomato paste in the dressing. Sun dried tomato paste is a very useful thing to keep, just dilute with some vinegar or water, some garlic powder and extra virgin olive oil and make a nice salad dressing quickly. 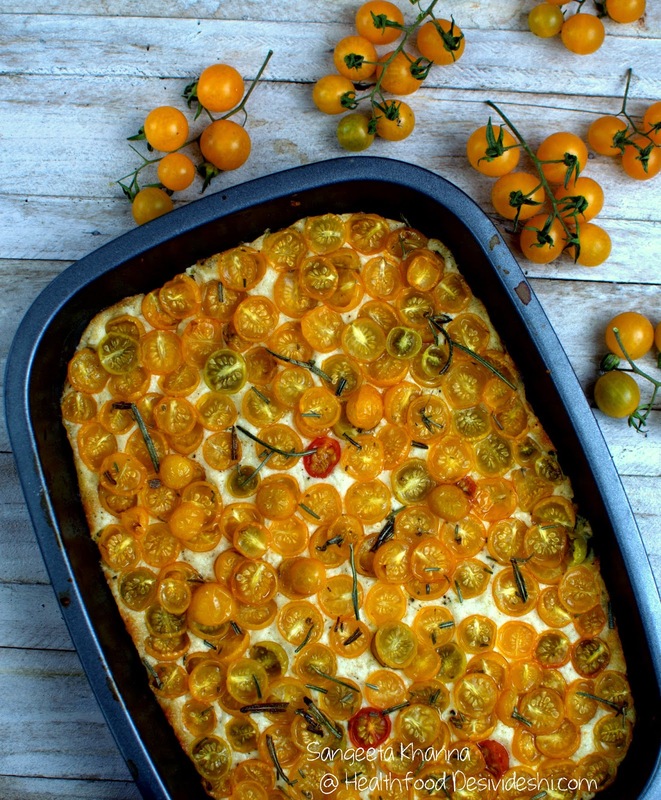 But the happy yield of yellow cherry tomatoes made me try them for a crust less ricotta quiche. I don't mind a nice crust in my quiches, I even make a quiche with cornmeal crust, but this time I wanted something that can be consumed in one go between the two of us, so to keep the serving size suitable I skipped the crust. The recipe got quicker and easier too. The recipe uses minimal ingredients and made enough quiche for 3-4 servings if served with some crusty bread and some sauteed vegetables on the side. Crusty bread because the quiche is very soft and creamy, yet well set to be made into neat wedges. I had baked it in a rectangular baking pan so we just cut square pieces and ate merrily without any bread. A side of sauteed vegetables is enough with this crust less quiche when it is just the two of us. The leftover was sandwiched between slices of whole grain bread though. Mix everything together except the tomatoes. Mix the ricotta, cream and herbs together and knead well to make smooth sticky dough like mix. You can add some sun dried tomatoes to the cheese mix or some steamed spinach which has been drained of all water. I left it plain as there was no crust to support vegetables. 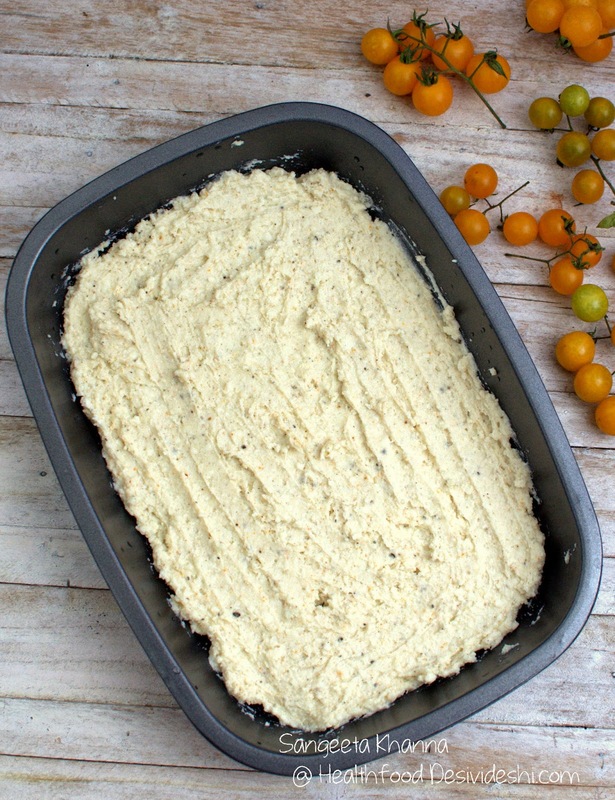 Grease the pan (9"X7" size) and spread the ricotta cheese mixture on the base. Spread it using your fingers or a silicon spatula. Now layer the halved cherry tomatoes over it. You can use slices of any tomatoes you like. Press down the slices to embed them into the quiche. Sprinkle some more herbs and drizzle olive oil or mustard oil over the tomatoes. Trust me mustard oil tastes really good with ricotta. Now bake in a preheated oven at 200C for 20 minutes or till the sides start bubbling and start getting pinkish. The tomatoes look shrinking and slightly dehydrated. This quiche is a minimalist recipe, the day I baked it was a hurried day and I clicked minimalist pictures too. But I think the taste and aroma of this ricotta quiche is something that I can feel even now staring at the picture. Hope it reaches you too. 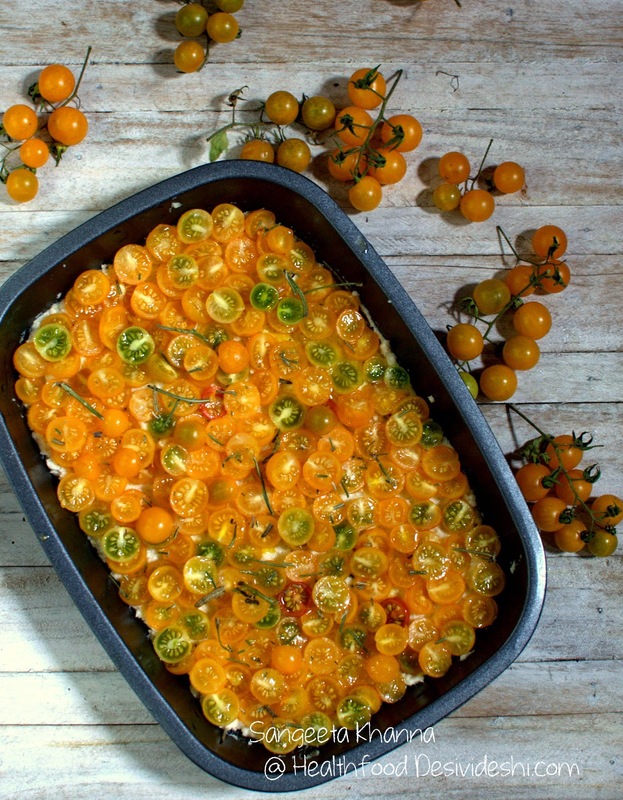 This ricotta and cherry tomato quiche keeps well in refrigerator, gets more set and reheats well to become soft again. The tomatoes may get pulpy after reheating but that allows their flavour to meld with the cheese layer better if the leftover is being used to make a grilled sandwich. There are some more yellow cherry tomatoes being sun dried. Will be back with some more recipes using them. they look so cute.. :) where did u get the seeds from? Thanks Supriya. I got he seeds from some exhibition, from a Himachal stall, labeled as peela tamatar. I will be trying this recipe tomorrow. My zumba instructor has given me a lot of these tomatoes, and I need to use them asap. Thank You for the beautiful recipe!